I must admit, I'm having fun with this. And I love showing my girls my new creation when they wake up in the morning. OK - on to day 2. 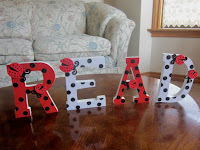 I had pinned these FANTASTIC letters made by Jaime at What's The Buzz in 1st? You can see all of them at her Etsy store by clicking here. They are sooooo cute it makes me wish I had a ladybug theme in my classroom (but I'm not sure my grade 6 boys would go for that). And then, two days later, my sister came out to the cottage with THIS - a birthday present her kids had made for Popa. 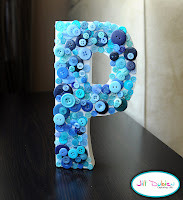 I knew fate was telling me I JUST HAD to make these letters ... so off to Walmart I went for some 8" letters, scrapbook paper, ribbon, and mod podge. I wanted to keep my letters in the same colour scheme I am planning for my classroom, so I was happy (happy dance happy) when I found scrapbook paper in the perfect colour range. (I actually bought a HUGE package of scrapbook paper so I can bring it into the classroom - the last time I needed special paper I couldn't find any in the ENTIRE school). I glued the scrapbook paper onto the letters with mod podge and then used a glue gun to attach the small ribbon around the edges (this step was a HUGE pain - literally - I burnt my fingers three times) - but I LOVE the effect ... and I would do it again. I put two more coats of mod podge on the top when I was done. Voila! I can't wait to set these on top of our classroom library! I took the picture with my letters on my bulletin board paper - I'm so happy with how well they turned out! What are your pinterest inspirations? Ok...I gotta run...off to Wal-Mart!!! Seriously, I LOVE it!!! This will be made this weekend!!! I love this. The paper on the R matches your blog!! I'm thinking of making "READ" and "WRITE" for our Literacy Office, but I am loving that crayon art from yesterday. Pinterest is the bomb! So many great ideas on there. And guess what? I just pin your READ sign to my board. =) Love sharing crafty creations. Thanks for sharing your finished product! SO cute! I made the same thing last week and posted it on my blog....I love palm trees so I added them to my letters! You can check it out! I love your blog! I absolutely love your craft ideas this week. The crayon masterpiece turned out wonderful and I love the READ sign. You have inspired me to try these! Thanks for sharing! so cute! i might have to do it too. This is great! Thank you for sharing. I'm going to try the same thing now AND I've pinned you to my board. As soon as I enter this comment, I am off to get the kidlets ready and head off to walmart to pick up some letters. These are seriously cool!